This article is about a mountain plateau in Slovenia. For the settlement with the same name, see Snežnik, Ilirska Bistrica. "Monte Nevoso" redirects here. For the Monte Nevoso in South Tyrol, Italy, see Schneebiger Nock. For the eponymous ship, see SS Monte Nevoso. View from Big Mount Snežnik (Veliki Snežnik). To the right, the Drago Karolin Lodge. 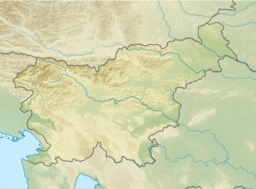 Snežnik (pronounced [snɛˈʒniːk]; Italian: Monte Nevoso) is a wide karst limestone plateau with an area of about 85 km2 (33 sq mi) in the Dinaric Alps of Slovenia. It mainly consists of Cretaceous limestone, with Jurassic limestone and a small amount of dolomite at the top. The surface was transformed by ice in the last glacial period. It is generally level, but has numerous dry valleys, sinkholes, about 300 caves and shafts, and cold-air pools with temperatures reaching −32 °C (−26 °F) in the coldest part of year. The surface is mainly stony, covered with patchy and shallow soil, except for the larger depressions. Because the plateau is only 28 km (17 mi) from the Adriatic Sea, it has up to 3,000 millimetres (120 in) of precipitation per year. It is covered by snow in winter. Due to the karst nature of the plateau, there are no surface streams. The vegetation of Snežnik was first studied in the 19th century by Heinrich Freyer, who was later the curator of the Estate Museum of Carniola in Ljubljana. It is Central European, with a large contribution of Southern European species and montane flora above the timberline. In sinkholes, vegetation inversion and a lower timberline (otherwise rare in Slovenia) may be observed. The plateau is covered by beech and fir forests, except for the highest parts covered by dwarf pine and grass. The area of Snežnik above 1,450 m (4,760 ft) covers 196 hectares (480 acres) and was protected in 1964 as a natural landmark. It is a habitat for Edraianthus graminifolius, Arabis scopoliana, Campanula justiniana, Nigritella rubra, Gentiana clusii, Gentiana pannonica, and other flowers. The animals living there include brown bears, wolves, deer, wild boars, and lynx, as well as a number of bird species such as the Ural owl, corn crake, western capercaillie, hazel grouse, and golden eagle. The plateau has two peaks, separated by a pass. Its lower peak, Little Mount Snežnik (Slovene: Mali Snežnik), has an elevation of 1,688 m (5,538 ft). Its higher peak, Big Mount Snežnik (Veliki Snežnik), has an elevation of 1,796 m (5,892 ft). Big Mount Snežnik is the highest non-Alpine peak of Slovenia and the highest peak along the National Liberation War Courier and Signal Operator Trail (Slovene: Pot kurirjev in vezistov NOV Slovenije). It may be seen from many other parts of Slovenia and is a popular hiking destination. It offers an extensive view and has a toposcope. It is most easily accessible from Sviščaki, a hamlet of the dispersed settlement of Snežnik, on the plateau. The Drago Karolin Lodge (Koča Draga Karolina) is located just below the peak of Big Mount Snežnik towards the border with Croatia. It was first built as a shelter under the leadership of the professor and mountaineer Drago Karolin, the president of the Snežnik Ilirska Bistrica Mountaineering Club. It was expanded from 1977 to 1994 and named after its first builder. Slivnica is considerably high. Snežnik is much higher. This mountain, the neighbour of which is the castle with the same name, is completely pointy and a true sky drill, because it raises you so much that you may wander with eyes all across the country, yes, you may cast the rays of your eye across the sea, to Italy, to Croatia, to Turkey, and everywhere around. It lies on the Croatian and Dalmatian border and harbours dreadful wilderness. ^ a b c d e "Snežnik-Pivka". Sigma2 (in Slovenian). Science and Research Centre of Koper, University of Primorska. ^ a b c d e f Dobnik, Jože (2011) . "Pot kurirjev in vezistov NOB" [National Liberation War Courier and Signal Operator Trail]. Pespoti.si. Planinska zveza Slovenije [Mountaineering Association of Slovenia]. Geodetska uprava Republike Slovenije [Surveying and Mapping Authority of the Republic of Slovenia]. Društvo Domicilnega odbora kurirjev in vezistov NOV Slovenije [Society of the Domicile Board of the Couriers and Operators of the National Liberation War of Slovenia]. Točka Veliki Snežnik [The Veliki Snežnik Point]. Retrieved 28 February 2012. ^ a b Wraber, Tone (November 2003). "K ledinskemu imenstvu na ovršju Notranjskega Snežnika" [To the Fallow Names at the Top Area of the Inner Carniolan Snežnik]. Planinski vestnik [Mountaineering Gazette] (in Slovenian). Mountaineering Association of Slovenia. 103 (11): 31–34. ISSN 0350-4344. COBISS 23631970. ^ a b Lukan, Tadej. "Snežnik". Hribi.net. Retrieved 28 February 2012. ^ "Slava vojvodine Kranjske - in Slovenije: tri stoletja najimenitnejšega Valvasorjevega dela" [The Glory of the Duchy of Carniola - and Slovenia: Three Centuries of the Most Outstanding Valvasor's Work]. Planinski vestnik [Mountaineering Gazette] (in Slovenian). Mountaineering Association of Slovenia. 89 (3): 112–115. 1989. ISSN 0350-4344. Wikimedia Commons has media related to Snežnik. Snežnik. VR panoramas (surround photography) of Snežnik. Boštjan Burger. (Rich media - may be viewed with QuickTime). This page was last edited on 22 December 2018, at 08:36 (UTC).